Tom Araya has opened up on the contract dispute that led to Dave Lombardo getting the sack from Slayer. The band split with drummer Lombardo for a second time in 2013. He was replaced by Paul Bostaph – who had also stepped in when Lombardo left in 1992. Frontman Araya has spoken out to “set the record straight” on Lombardo’s latest exit and says the sticksman talked his way out of the lineup. Araya tells The Skinny: “Going back a long time now, 15 years nearly, we were looking for somebody to sit in for Paul Bostaph — that’s how long ago it started with Dave. Paul decided to move on, but he stuck with us until we could find a replacement. “We came up with a simple agreement that lasted a while, and then we were in the process of trying to make it better for Dave. We came up with a deal and he basically was getting everything he wanted, but it was a three-year term, and three years into that, we still hadn’t been able to get him to sign it. Bostaph returned in time for Slayer’s upcoming 11th album Repentless, which is released on September 11. 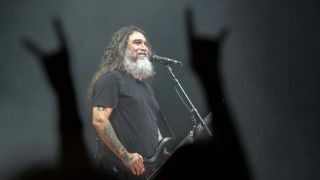 Slayer tour the UK with Anthrax in November.